In 1973 Norma Montoya painted “Innocence” an abstract art vision that contributed to the historical movement of murals at the Estrada courts. This piece of art is located in the community of East Los Angeles (Boyle Heights), California. 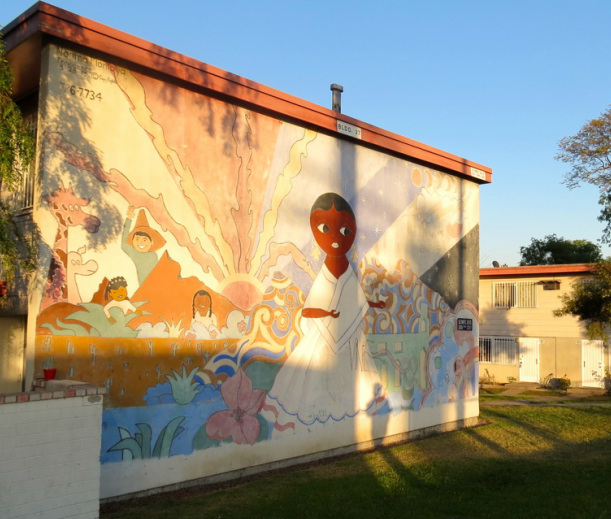 By community members is known as “The Projects.” However what makes this place so significant is that it has over fifty-three murals (Montoya). Murals bring a sense of culture to this community. In addition murals are technological tool where it teaches the community about issues that are relevant to their experiences. The significance of how important the murals are to the community is shown by how these murals have survived since the 70s making the community part-reconstructing history from their perspective. Allowing a space for communities of color to voice their concern towards social issues. An analysis of the mural “Innocence” reveals how the Estrada Courts community challenges oppression by providing a space where the children are able to dream and hope. As an artist Montoya describes that the mural “innocence” represents the childhood fantasies, places where children could escape their reality in this case poverty. Yosso (2006) argues that communities of color have various forms of capital, shown through cultural wealth. In this case the mural focuses on aspirational capital, which is aspirations and dreams of a better life. In a time where political issues are its highest, one may feel overwhelmed and this mural focuses on children and how they may be in a state of “unhappiness”(Montoya). Here the mural represents a form of resistance and inclusion of the children and youth. In addition, the mural is not only a form of resistance by also a form of cultural capital.